Top row (left to right): 1. Jeff Benton, 2. Kerri Bennett, 3. Chester Smith, 4. Debbie Graham, 5. unidentified, 6. Sharon Ainsworth. Second row: 1. Fred McMillen, 2. Ruth Winslow, 3. Ricky Bischel, 4. Sandra Hand, 5. Jonathan Winslow, 6. Jean Ratcliffe. Third row: 1. David Simons, 2. Ginger Der, 3. ? Hancock?, 4. Mary Regan, 5. Scott Perkins, 6. Debbie Kendrick. Fourth row: 1. Ken Kline, 2. Terri Bothwell, 3. Bob Lamee, 4. unidentified, 5. unidentified, 6. Brian McFann. Fifth row: 1. Tim Bradley, 2. Sarah ?, 3. Janis ?, 4. Mary Kate Murphy, 5. Carl ?. Sixth row: 1. SallyMarie Ritchie, 2. Mr Teel, 3. Mrs Lewis, 4. Danny Nigg. Credits: From the collection of Brian McFann. 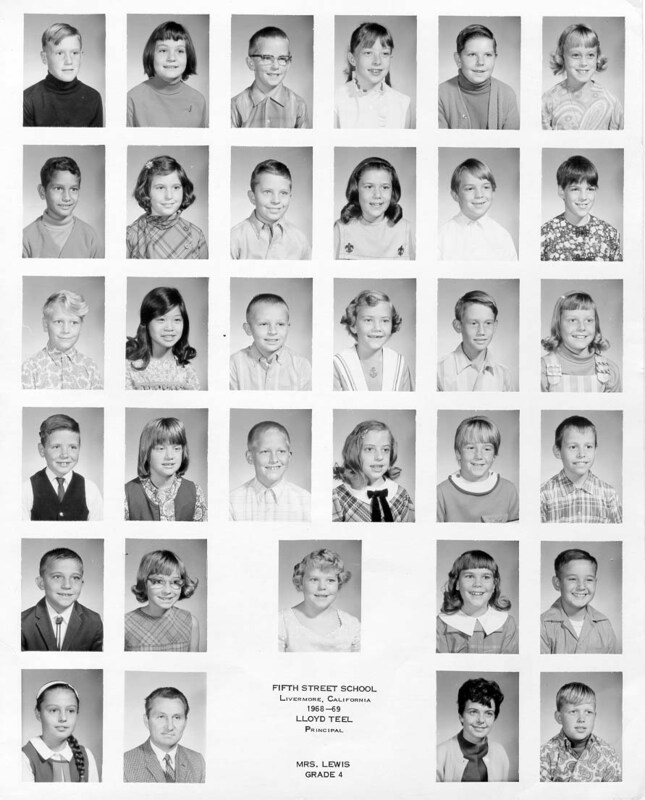 Thanks to SallyMarie (Ritchie) Slaughter for helping to identify the kids in this picture.